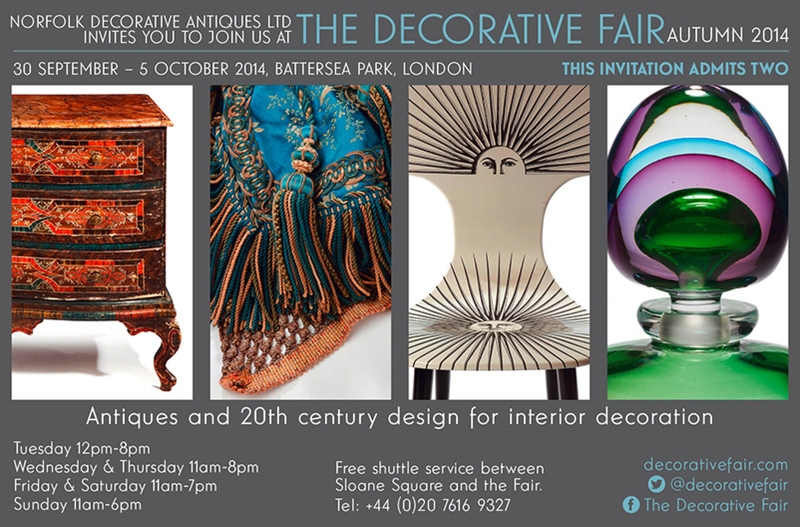 The latest outing of the Decorative Fair is nearly here. September fairs are always the best attended and have great stock from all the regular dealers who collect a lot of it during their summer 'holidays'. Trends this year incude `blue and white' in all its forms, checks and tartans, and big old chandeliers which of course is good for us. We are always in the same spot, 1st stand on the main Isle as you come in from the foyer usually its stand 89 or 90 depending on how many exhibitors there are and how the fair configures. We have many photos from the fairs which we have been attending regularly since 2004, this will be our 31st Fair and as usual Maurice will be helping with the vetting of the Lighting Exhibits. The Decorative Fair is like no other, it is relaxed, harmonious (mostly) with a great cafe and champagne bar, all the dealers know each other and most of the clients, it has atmosphere and is quite trendy attracting lots of famous faces to all the three fairs. No one feels intimidated or unwelcome and of course there are the Dogs who come with their well behaved owners and chat away to the other dogs! September 5th Opens at noon to 5th October - closes at 6.